Honeymoon in Mexico - Giveaway! Todd Events and Destination I Do Turn 10! A decade of awesomeness has lead us here and who better to celebrate with than Todd Events, who is also turning 10! Wedding planner to the likes of Eli Manning, Tony Romo and other athletes and celebrities, Todd Events has become synonymous with extraordinary events around the globe. And Todd Fiscus, the head of the highly acclaimed design team was recently hired to do the design overhaul of the stunning Mahekal Beach Resort in Playa Del Carmen (resort officially opens December 2014). This is where we bring YOU all in to help us celebrate! To celebrate this milestone 10th anniversary, we're offering a free honeymoon giveway at the very place Todd Fiscus will be redesigning - the Mahekal Beach Resort! Five nights at the Mahekal Resort in Playa Del Carmen (Opens December 2014). Todd Fiscus will provide a custom one-of-a-kind honeymoon book to the winning couple, outlining the area and his favorite things to do in Playa Del Carmen. Once the winners are selected, Todd will contact them to tell them a bit more about the resort and personally congratulate them. Email info@destinationido(dot)com with the subject line "10-Year Anniversary Honeymoon to Mexico Contest"
Destination I Do magazine will begin taking entries at 12:01am Eastern Time on September 17, 2014 and will close the contest at 11:59pm Eastern Time on October 14, 2014. 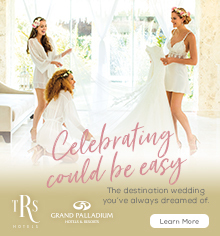 Win a Honeymoon to Mexico Contest is co-sponsored by Todd Events and Destination I Do magazine (owned and operated by Destination Media, LLC). WHAT YOU WIN: The winners of the contest will receive: a five-night stay for two at the Mahekal Resort in Playa Del Carmen (Opens December 2014). The overnight accommodations, fees and taxes will be included (approximate value - $3,000). Any incidentals, in-room amenities, spa treatments or meals purchased by the couple are not included. Currently airfare is not covered. Travel must be completed after December 2014 (the hotel’s opening) and before 2016. 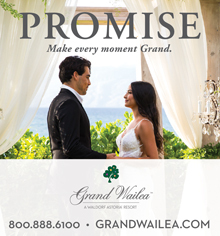 Winners need to notify the resort at least 30 days in advance of desired dates. Rooms subject to availability. The prize is non-transferable and has no dollar value. Only one couple will win. ELIGIBILITY: You must be at least 18 years of age or older and a legal resident of the United States to enter to win. You must have a working email address and provide a working telephone number at the time of entry. If you are selected and unable to be reached, a new winner will be selected. If you have already had a honeymoon, you are ineligible. The purpose of this contest is to provide a honeymoon prize to a couple who had recently been married or is engaged to be married and has not yet experienced a honeymoon. Information provided to Destination I Do magazine must be true and correct. The contest is limited to one entry per household. If the entry is inaccurate, a duplicate entry or past the 11:59pm ET October 14, 2014 deadline the entry will be ineligible and removed from consideration. Any entry submitted to Destination I Do magazine becomes the property of the magazine. The entry will not be replied to or acknowledged in any way. By emailing your entry, you are permitting Destination I Do magazine to contact you via phone, mail or email. By emailing your entry, you are agreeing to the rules of this contest. SELECTION OF WINNER: A random selection will be made on October 22nd and supervised by a Destination I Do staff member. Once that selection is made, the individual will be contacted via email and phone. If no contact is made within three business days, another random selection will be made. This will continue to happen until contact has been made. The winner will be required to sign a liability/publicity release and sworn affidavit of eligibility. If this form is not signed and completed in it’s entirety within five (5) business days, the prize will be surrendered and another winner will be randomly selected. 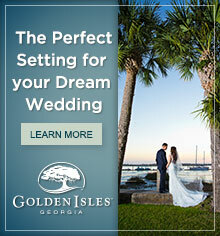 Destination I Do magazine and Todd Events are legally required to report value for tax purposes. For all taxes and additional expenses above and beyond what is covered by the contest are the sole responsibilities of the winner. RULES & RESTRICTIONS: By entering this contest, the entrant is bound by and completely agrees to the rules of the contest. By entering the contest, the entrant is granting permission to Destination I Do magazine and Todd Events to use the name(s) and identity of the winner, photos of the winner, what the prize (including value) consists of for the use in print, online coverage and social media use without providing any compensation. Participating in the contest, you hold Destination I Do magazine and all its affiliates (including Todd Events) harmless for any injuries, damage, loss (to persons or property) associated with the acceptance of this prize of this contest. 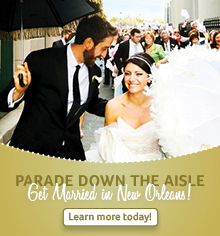 Destination I Do magazine and Todd Events reserve the right to amend the contest rules. 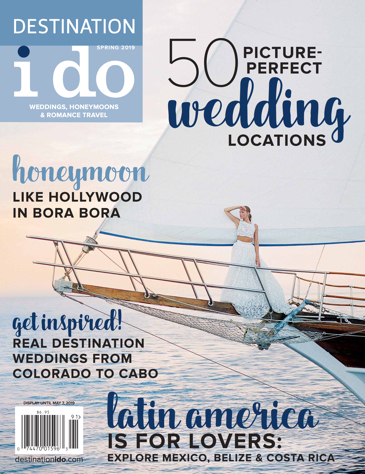 Destination I Do magazine and Todd Events may permanently disqualify anyone they believe may have tampered with contest or is in violation of the contest rules. By entering this contest, you agree to the rules of the contest and hold Destination I Do magazine and Todd Events harmless of any wrongdoing. If there are any questions, concerns or issues surrounding your voluntary entrance into this contest, all disputes will be resolved and enforced in accordance with the laws of the State of Arizona, without regard to its conflict of law principles. State, federal and local laws and regulations apply; void where prohibited. NO PURCHASE NECESSARY; YOUR ODDS DO NOT INCREASE IF YOU PURCHASE ANYTHING.